Tampa, Fl -- It won't be the end of the world, it will be the beginning of fair treatment to the entire population but with every small victory and even if at the DOMA is completely overturned there are still paradigms to break down in the most closed-minded sectors of the population that still see any advance of social rights as a corrupted form of socialism because they don't know the correct definition and see every help, every advance to the population as a form of selling the country. The main victory of Obama on a long term in terms of social progress will be the repeal of the DOMA which was signed by a Bill Clinton on 1996, showing that even if two people are from the same party they can have a juxtaposition on their beliefs about civil rights but slowly Obama has taken steps into overthrown one of the biggest mistakes that was vetoed by a fellow Democrat. If it wasn't for DOMA there could be a federal victory regarding the recognition of benefits to spouses, one of those examples that could be turned into a memory are the recognition of benefits for the armed forced spouses who are not entitled because of DOMA on the benefits of their better halves but at the end the overturn of DOMA will be in the hands of the Supreme Court but in the meantime Obama can continue his work in landing benefits to all soldiers equally but the situation can turn complex for the President as the legislative body is composed by the opposition but if he aims towards a congressional law then his odds can turn for better as well the lives of many people. Employment Non-Discrimination Act can be an issue and one of the failed attempts on the Romney campaign when the former candidate offered jobs to all Americans but the speech of Romney was only half way truth to the reality that many red States such as Florida are oriented regarding discrimination based on sexual orientation and is a common practice to fire someone for being gay, lesbian, bisexual or transgender and the person who gets fired in question have little to no protection to claim back because of the States laws regarding discrimination. That could be one more crucial victories if it's achieved on a Federal Level as it can grant protection to many individuals who feel threaten by their employers because of any biased speech any employee can give against their persona. Is not fair that even 30% of the States offer some protection, people are still getting discriminated against their personas. Overall there has to be a reform to the immigration laws, that probably could strike as one of the biggest achievements of the Obama administration if DOMA is overturn, yet so far had been a few winning cases of bi-national couples and it could be a major victory because families beyond the hetero-normative standard can improve the economy when the nucleus is kept together and they are offered protection from the government. 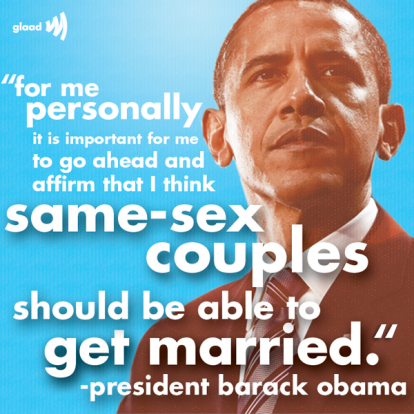 If Obama can realize that beyond who the person is, what color of his skin, religion, gender identity, ethnicity, if he achieves a general protection and defends the constitution even further then he will be remembered as one of the greatest civil leaders and the first President of the United States who stood for the LGTBQ community.